Andrew McCord was the third son of John and Mary McCord. He was born at on 9th May 1898 in the Cookstown area. John McCord was a Railway Platelayer. By the time of the 1911 census, John’s father had died. His mother still lived in Grange, but the family were no longer living together. There is a 12 year old Andrew McCord living with and working as a servant in Tullyhogue. Andrew enlisted in Cookstown about September 1915. Private Andrew McCord had gone to the Front around May 1916. 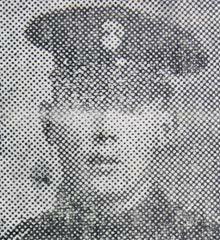 Private Andrew McCord was serving with the 2nd Battalion of the Royal Inniskilling Fusiliers when he was killed in action on 10th July 1916. He was 18 years old.